Envinity Group has developed a revolutionary system that can rapidly filter large quantities of fine particles and ultra-fine particles from ambient air. By integrating new and existing technologies in an innovative way, we have succeeded in developing a new air filtering system. Envinity Group has developed a revolutionary system that can rapidly filter large quantities of fine particles and ultra-fine particles from ambient air. By integrating new and existing technologies in an innovative way, we have succeeded in developing a new air filtering system that cleans 80,000 m³ of air per hour within a 300 metre radius and up to a height of 7 km. 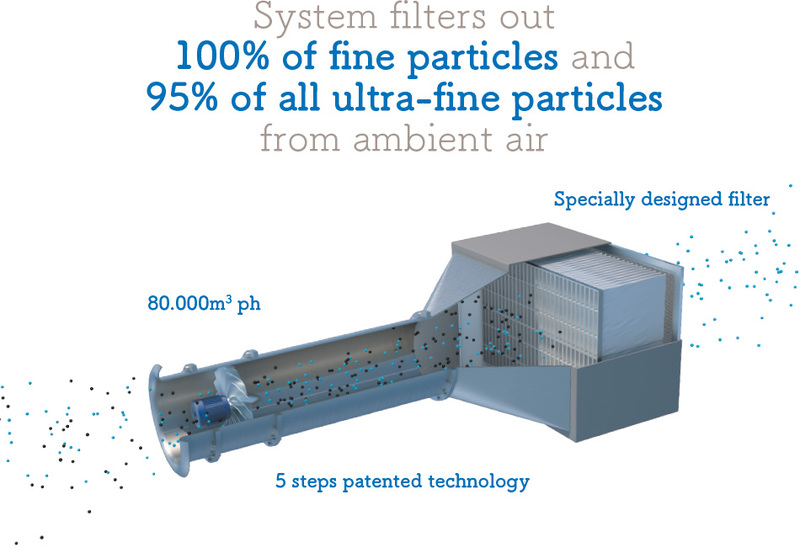 Using five sub-processes, this system removes 100% of the fine particles and 95% of the ultra-fine particles from the ambient air, according to official test results. The system is not only revolutionary, but also the only one of its kind in the world! Envinity Group is making it possible for governments and businesses to protect their environment against the “silent killers” that are fine- and ultra-fine particles, and to stop worrying about dramatic economic effects.